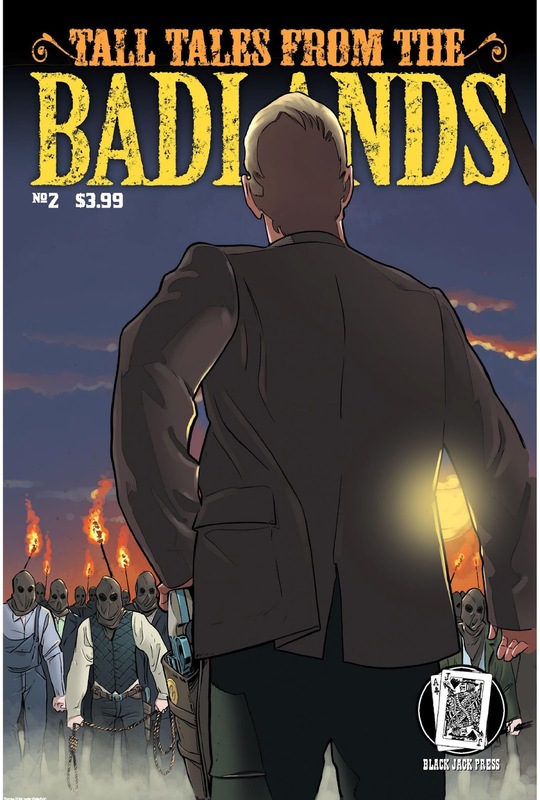 The Fellowship was fortunate enough to obtain a copy of TALL TALES FROM THE BADLANDS #2 from Black Jack Press. The stories are written by Sean Fahey, Nick Nunziata, and Seamus Kevin Fahey. The art is by Borja “Borch” Pena, Giannis Milonogiannis, Carlos Trigo, Pablo Peppino, and Ger Curti. “A Nation of Laws,” the town’s sheriff is trying to maintain control until the new judge comes to town. But what will he do when his faith in the justice system is tested? In “The Great Wall,” a Chinese man babysitting his great grandson tells him of the stories behind his pictures. They all represent proud moments in the man’s life…even the photo wasn’t allowed to be in. In the tragic tale “Paw,” what lengths will a dying man go to get revenge for the death of his grandson? “The Fastest Way from Here to There” shows that life can be a full circle, even for a wild horse. “The Inside Man” tells the story of Calvin Fisher, a Union Pacific Railroad employee for ten years. When all he gets for his hard work and loyalty is a pat on the back, will he decide to trade than in to get his hands on the company’s payroll? These are some very solid and interesting stories backed up with impressive artwork. Westerns used to be real big in the comics industry a long time ago. Now, it’s very rare to see one. I hope titles like this one will bring the genre back. TALL TALES FROM THE BADLANDS #2 is available at comics.drivethrustuff.com.